through the development of a Sandbach Neighbourhood Plan"
Cheshire East Council is backing Sandbach’s efforts to prevent unsustainable and unplanned development. The Council has now formally received Sandbach’s Neighbourhood Plan – the first from a town in Cheshire East. It follows Council Leader Councillor Michael Jones support for a programme to enable communities to deliver neighbourhood plans across the Borough – to help shape development in the local area. Neighbourhood Plans enable local people to have a say in the development they would like to see in the area in which they live. Sandbach Town Council, which covers a semi-rural area with a population of 17,976, successfully applied for designation, which was approved by Cheshire East Council in October 2014. The plan will now be the subject of a final six weeks of public consultation before being scrutinised by an appointed independent examiner. A positive examiner’s report will then mean the plan can progress to a local referendum, when local people will be given the opportunity to vote and bring the plan into effect. 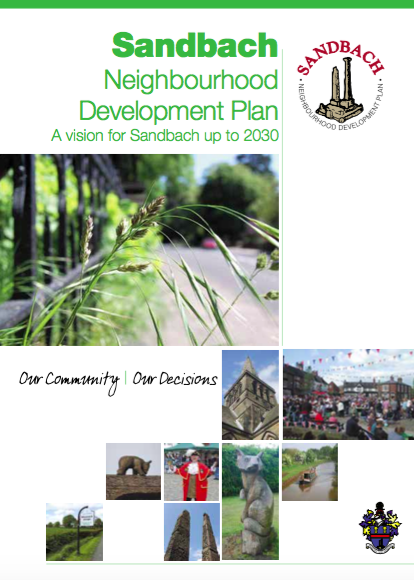 The policies in the Sandbach Neighbourhood Plan will then be given their full weight in deciding planning applications. A traditional Cheshire market town, Sandbach has a wealth of history, an outgoing and energetic population and a thriving town centre. Its excellent communication links, outstanding schools, multitude of sporting and leisure organisations and beautiful surrounding countryside speak volumes about the quality of life in this attractive vibrant town. Sandbach is renowned for the size and quality of its Thursday Market, held each week on The Commons and throughout the town. The town centre includes some well-known High Street stores but mainly consists of independent local specialist retailers who pride themselves on offering high quality, unusual products at the right price. It also boasts a regular monthly Farmers’ and Artisan Market held in the Market Square, beside the historic Saxon Crosses.